Note: This is a grant forecast; the application is forecasted to open on or about April 07. Inquiries about partnership opportunities between organizations and communities both inside and outside of North Minneapolis are encouraged. The City of Minneapolis is hosting information sessions around the Target Market Program, a new procurement process to open up more opportunities to small businesses. Attend these information and enrollment sessions to network with City Procurement staff and enroll in the program on the spot! The open house is an opportunity to view the redevelopment proposals under consideration by the City of Minneapolis and provide input to City staff as the evaluation process continues. The City received seve proposals in response to the RFP issued in November 2016. Please see the link below for a summary of the proposals. After an initial review, City staff have selected four finalists for further consideration based on the strength of the proposals and the evaluation criteria identified in the RFP. The four finalists include: Ideal Development Group. JB Vang Partners, Real Cooks Kitchen, and Urban Enterprises Inc. Following the open house on April 12, City staff will finish it's internal review and plans to make a recommendation to the City Council in late May or early June 2017 in order to move forward with one of the proposals. If you are unable to attend the open house but would like to learn more about the proposals being considered, and provide input to City staff, please see the information below and contact Casey Dziewczynski at (612)673-5070. 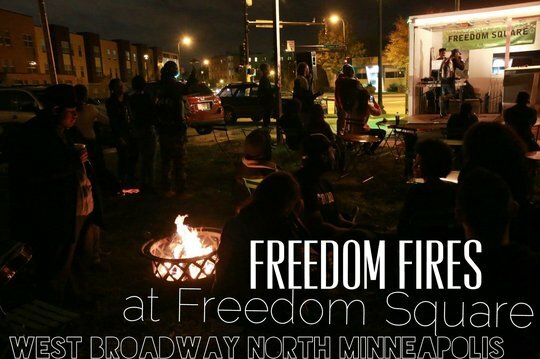 Don't miss the 3 upcoming Freedom Fires at Freedom Square! Food, bonfire and live entertainment! The night's assignment was "Afromation," a full-figured black woman, sporting an outsized afro, with affirmations written in her hair. Twenty black women sat at easels in a makeshift studio, ready to paint. Me'Lea Connelly, a private firm manager-turned-economic-activist, recently embarked on the long process of establishing a black-led credit union to solve problems like Moore's. "We have communities that are underserved and also taken advantage of by the most predatory business in our state." The DFL's leader in the state House of Representatives is not apologizing for a crack about white men during a floor speech that led at least one Republican colleague to demand on Tuesday she resign from he leadership post. Under ordinary circumstances, the 40 students from North and Southwest high schools would never have met. Ten miles of Minneapolis and a world of differences divide them. But there they were, twisting and leaping over one another at the Guthrie Theater last week in a performance that celebrated teen spirit, dance legacy and the bridge-building power of the arts. Twin Cities Mobil Market - It's a Market on a Bus!